If you have any questions about the GIVI information page below please contact us. The motor yacht GIVI is a 60 m 197 (foot) important steel ship which was newly built at CRN Yachts (Ferretti Group) and conceived in the office of Crn and Studio Zuccon International Project. The notable full displacement yacht GIVI is a very high quality Italian made superyacht which was launched to much satisfaction in 2006. The firm of naval architecture which delivered her design details on this ship is Crn and Studio Zuccon International Project. Also, the interior design was created by Studio Zuccon International Project. She is a recent full displacement yacht. Like her 54 metre (177 ft) little sister called Ability, motor yacht GIVI features a "beach" on her lower aft deck - on of the first superyachts to have a lower room opening onto the water at her aft deck. Panoramic sea views surround guests on her large sun deck and in her comfortable sky lounge and her interior utilised muted colors and simple, but elegant, forms in creating a refined and restful setting. Likewise, her furniture which, is displayed on parquet floors, also reflects a stylish Italian design. Crn was the naval architecture company involved in the professional vessel design work for GIVI. Her interior design was realised by Studio Zuccon International Project. 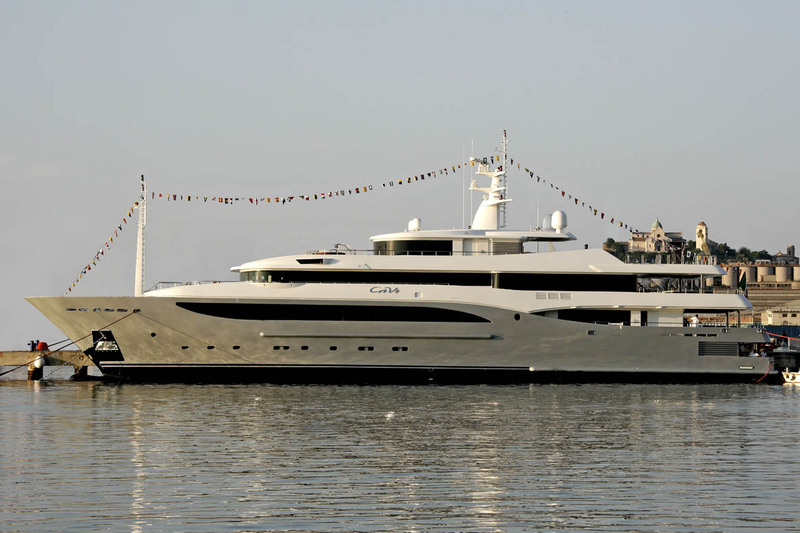 Crn and Studio Zuccon International Project is also associated with the yacht general design work for this boat. Created by Crn Yachts (Ferretti Group) this vessel was constructed in the recognised yachting country Italy. 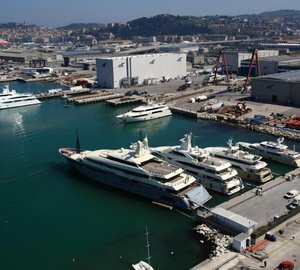 She was officially launched in Ancona in 2006 before being delivered to the owner. The core hull was constructed with steel. The motor yacht main superstructure is fabricated predominantly using aluminium. With a beam of 11.2 metres / 36.7 feet GIVI has fairly large interior. She has a fairly deep draught of 3.5m (11.6ft). She had refit improvement and alteration work carried out by 2008. Powered by twin CATERPILLAR diesel engines, GIVI can reach a top speed of 16 knots. She also has an economical range of 6000 miles when underway at her cruise speed of 15 knots. Her total HP is 4460 HP and her total Kilowatts are 3280. The important luxury yacht motor yacht GIVI is able to sleep as many as 12 people in addition to 20 crew. 60 metres / 197 feet. Giving the combined power of 4460 HP /3280 KW. Caterpillar 2 times 200 kilowatts + 1 times 60 kilowatts. Castellammare di Stabia. Italy. Provincia di Napoli. Campania. On Sept 2009 GIVI went to Castellammare di Stabia, in Italy. GIVI also navigated the waters encompassing Provincia di Napoli during the month of October 2009. As she enjoys the facility of a landing area for helicopters aboard, GIVI can transport passengers and/or supplies over to another remote area. The luxury yacht GIVI displayed on this page is merely informational and she is not necessarily available for yacht charter or for sale, nor is she represented or marketed in anyway by CharterWorld. This web page and the superyacht information contained herein is not contractual. All yacht specifications and informations are displayed in good faith but CharterWorld does not warrant or assume any legal liability or responsibility for the current accuracy, completeness, validity, or usefulness of any superyacht information and/or images displayed. All boat information is subject to change without prior notice and may not be current.